Accuracy +/- 10 ppm ( 0.01%) for 25 gms of sample. Stirrer Motorised Teflon coated magnetic stirrer. 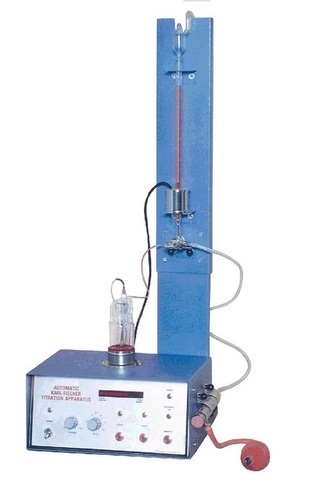 HAMCO AUTO KARL FISCHER TITRATION APPARATUS is used for accurate determination of moisture in various samples. The instrument is housed in a mild steel cabinet duly powder coated with built in magnetic stirrer & attached titration stand. Controls are mounted on the front panel for easy operation. HAMCO Karl fisher titrator finds application in chemical, pharmaceutical, food, cosmetic, oil & many other industries in QC and R & D Laboratories. Facility to transfer reagent from burette back to reservoir.